Cold hardy cactus, succulents & perennials for the rock gardening enthusiast. Step 1of 3: Determine your zone hardiness. Remember this includes both heat as well as cold tolerance. 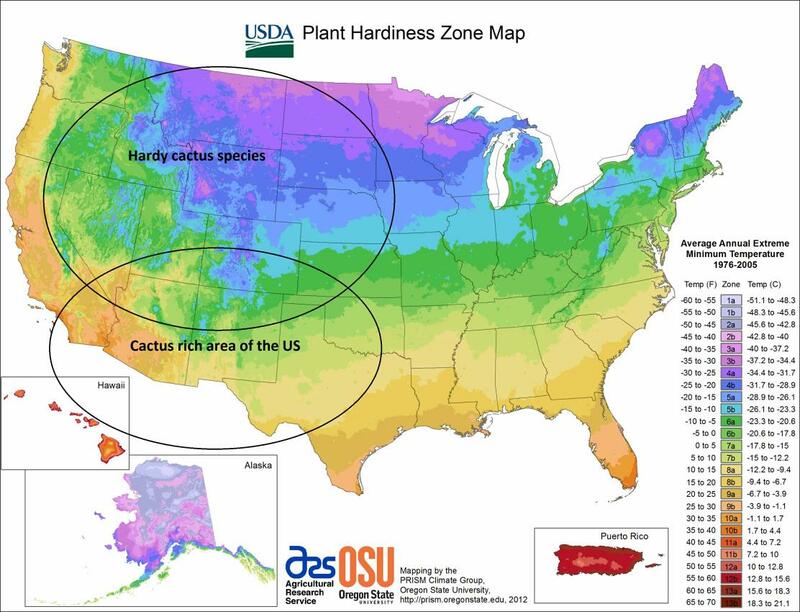 If your not sure what your zone is, I've provided a link to the USDA Zone Hardiness map. This will open a new window. Once there, enter your zip code to determine your zone.  On both the Cactus & Succulent plant pages, each plant description will list the compatible zones for that plant, such as Z4a-7a. The further the plants are grown outside of these parameters, the more likely the plant can be lost from excessive heat or cold exposure. Also keep in mind if your growing in containers to shave one full zone off the hardiness scale. This is because the whole plant ( roots and all ) are fully exposed above the ground level and are less protected from extreme weather. Step 2 of 3; Determine your soil composition. All of the following mixes are formulated for optimal growth based on the average annual rainfall for your area. Cacti and "Type 1" perennials are water sensitive and therefore all planting beds should be raised a minimum of three feet above the surrounding area for the best drainage. See the rain map further down the page for reference. Pea Gravel & Sand: Can be purchased by the yard at your nearest gravel pit for larger landscapes or by the bag for smaller applications from most nursery outlets. Note: When purchasing sand, make sure that it's a "washed" ( no dirt ) product, where water is used in the screening process verses a dry screen. Dry screened sand ( including road mixes ) contains too much dirt fines and will only make a good recipe for concrete. Active Soil Mix: A half & half mix of high quality potting soil and native soil. If your native soil is a hard compact type, then you can substitute earthworm castings or more potting soil if not available. Trace Minerals: The basic approach is to use rose fertilizer ( roses have similar requirements ), however a more comprehensive mix can be made with a combination of Dolomite Limestone, Superphosphate, and a volcanic mineral product called Azomite at a rate of 1/4 cup each per 5 gallon container or 1/2 cup each per wheelbarrow load. These products are most easily obtained from Internet sources as they are not commonly carried locally. Equal parts of each. 1 part pea gravel, sand, high quality potting soil & top soil. 2. If you receive less than 20 inches of rain per year: Place plants ( or sow seed ) below ground level in "watering holes" ( dug out circular or trough like depressions ) or low lying areas where rainwater or moisture can collect. This minimizes moisture loss and watering requirements. Dig depressions 4-6 feet in diameter ( up to 8 feet for trees ) per plant and down a minimum of 24 inches and backfill half of it with the plant mix. Additional potting soil can be used to top dress to further reduce moisture loss. 3. If you receive more than 20 inches of rain per year, then the plants can be planted at ground level or slightly raised beds. Minimum Soil Depth: For beds, the mix should be a minimum of 4 inches in depth, 18-24 is ideal as the deeper you go, the better the results will be. For containers, fill the entire container. Containers should be a minimum of 12 inches wide and deep for best root growth and moisture control. The larger the container, the better the results will be. Step 3 of 3: Transplanting prep & procedure. Cactus plants: Best transplanting temperature is above 70 degrees F as daytime highs ( 80's & 90's are ideal ). Rooting can still be done below these temperatures, but can take much longer and is not advised below 60 F. Make sure the cactus soil mix is mostly dry with just a hint of dust separating when dropping a handful into the air. If no dust separates, then the mix is too wet and more dry mix should be added. The mix can also be stirred up and allowed to dry out more. Once a little dust begins to separate out, then proceed with planting. Cacti are water sensitive and should not be watered after placing into the ground. Allow the mix to dry completely to a depth of 3 or more inches before lightly watering. After 6-8 weeks, the new roots should be formed and a deeper watering can be done. Plants can be gently nudged out of the ground every 2-3 weeks to check for progress. Regular watering is only necessary if natural conditions are dry while the plants are actively growing, typically between the end of March until about mid August for most areas. Allow the soil to dry completely to a depth of 3 or more inches if natural conditions are dry. Discontinue watering in late summer to harden off the plant for winter. Succulents & Perennials: Best transplanting temperature is between 50-70 degrees F as daytime highs. Plants need the cooler temps of early spring and fall to minimize dehydration of the leaves and stems from the heat of summer. Unlike cacti, succulents and perennials should be deep watered immediately after planting. Allow the soil to dry to a depth of 3 or more inches while the plants are actively growing. This is critical during the first one to two years to get the plants established. Once established, watering should only be necessary if natural conditions are abnormally hot and, or dry.